You really can use any vegetables you like when topping this lasagna, but this is how we made ours and it turned out spectacular – not to mention downright pretty! The no-boil noodles really make this dinner simple to throw together, even though it’ll taste like you slaved over the stove for hours. (Don’t worry, we won’t tell!) One of the beautiful things about lasagna is that it keeps like a champ in the fridge, so if you’re anything like us, you’ll be nibbling on it all week – pretty much a no-brainer for snack time! Aside from your creative veggie choices, this is about as simple a lasagna recipe as you’ll find. But don’t mistake simple for boring! This baby may be minus the meat, but it’s every bit as delicious! Preheat oven to 350º F and grease a 9x13 inch baking pan. Heat olive oil in a large skillet over medium heat, add mushrooms and sauté until slightly soft. Add garlic and sauté briefly, until fragrant. Transfer to a medium bowl and set aside. In a separate bowl, combine ricotta cheese, eggs, half of Italian seasoning (1/2 teaspoon), and salt and pepper to taste. 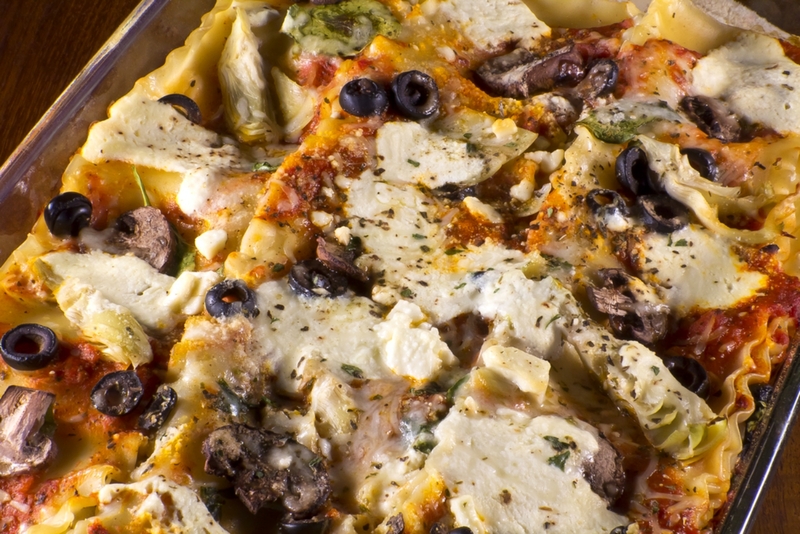 Place a layer of noodles in bottom of baking pan and spread 1/3 of the ricotta mixture over the top. Spread 1/3 of the tomato sauce over ricotta and place a layer of mozzarella slices on top. Sprinkle fresh basil over mozzarella. Repeat twice and top with mushrooms, artichoke hearts, olives and remaining mozzarella. Sprinkle with remaining Italian seasoning, cover with foil and bake for 25-30 minutes. Remove from oven and let cool for 10-15 minutes before serving.